A call to Camper & Nicholsons brings news that Jean-Marie Recamier has signed Mangusta's 33.5m motor yacht Ohana for sale. 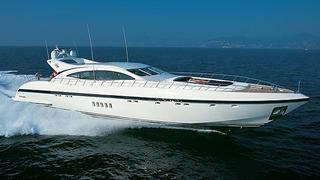 A Mangusta 110 model built by Overmarine in 2001 and refitted in 2010, Ohana boasts sleek exterior lines, complemented by a modern and luxurious interior design. She sleeps up to eight guests in four well appointed staterooms with room for five crew, while her spacious deck areas have ample sun pads and elegant alfresco dining areas. Ohana is asking €3.5 million.